Oh, look what arrived in the mail today! 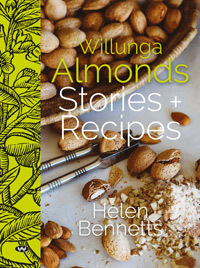 The now not-so-humble almond is very fashionable at the moment: almond milk is the latest fad (though it’s not a fad for genuine lactose-intolerant folk) and the gluten-free crowd (who include genuine sufferers of coeliac disease) use almond meal as a substitute for flour, so I have no doubt that Willunga Almonds, Stories and Recipes will be a very popular title indeed. Almonds are splendidly healthy (except for a small minority of people who are allergic to tree nuts). The Romans, it seems, believed that eating bitter almonds could counteract drunkenness, but perhaps it’s best not to rely on this when confronted with a breathalyser. But there is modern research which claims that all kinds of health benefits, though I suspect that weight loss may not be one of them if you binge on the choc-coated variety of almonds which are so very moreish. Almond trees were planted in SA even before it was proclaimed a colony, many people raising trees with nuts that originally came from the Cape of Good Hope in South Africa. Most of these were for domestic use and (strangely, since they’re deciduous trees) as windbreaks. But by the 1890s there were commercial plantations and by the 1930s almost 70% of Australia’s almonds came from the Sturt River area. The hero of commercial almond growing is Charles Ragless and his son Kenneth who developed an almond cracker to reduce the labour-intensive business of hand-cracking the almonds. I Googled Ragless, and found mention of him and his still-standing farmhouse on a site about the Tonsley Park Redevelopment, (a project to develop Tonsley as a new educational, industrial and retail hub now that car manufacturer Mitsubishi has gone). The book includes some interesting photos from the 20th century including a photo of Land Army girls at the harvest and some quaint tourism posters as well. A #PerfectTiming cauliflower and almond soup (we have caulis ready for harvest in the vegie patch) Update2/7/17 : I cooked this today (see the photo) and it was delicious! Salsa all’algresto, adapted from one of Maggie Beer’s recipes with her trademark verjuice, so we know it must be good. Sicilian rabbit with almonds, adapted from Spring in Sicily by Manuela Darling-Ganssar. Rabbit is a delicacy these days, but our local paddock-to-plate Berties Butcher can get it for us. Almond Vegetable Tagine made with sweet potato, which looks like a very useful dish when you have vegetarian friends coming for lunch. Almond blancmange. No, not like the blancmange we had for school dinners in London. It’s got Amaretto in it. Almond pannacotta, Almond tart, Pear and frangipane tart. The photos are irresistible. Sephardic orange and almond cake, yes the one you eat in cafés! Apple sauce fruit cake, baked in a loaf tin and with legendary keeping qualities. There are also other delights like Almond and orange seed bark and Crunchy granola. I will try to remember to take photos of my efforts in the kitchen! Update 15/2/17: here’s proof that these recipes work! and direct from Wakefield Press. I would never had thought a book about almonds could be so interesting! Oh, and I still have my Kenwood Chef Mixer from my twenties – not my 21st. Can’t quite recollect when I got it but I’d say around 25-28. But my, it is a heavy beast isn’t it!! Yes indeed. I kept it tidy away in a cupboard when I was younger, but lifting it out is getting too hard on the knees so now it lives on the bench. Needless to say I use it more often, especially now that I bake a cake at least once a week for my father. Yes, I can do lemons. Citrus varies greatly. You may know, for example, that you can’t eat grapefruits while taking certain medications, but you can eat normal oranges and lemons. However I can’t have ricotta, so that’s out. (My food regime is very complicated but since following it, for 30 years now on the advice of my GP, I’ve had far fewer bad outbreaks and have made much less use of steroids. People don’t really understand how complicated the food intolerance story is). As for the Kenwood. I reckon it’s good weight-bearing exercise! In our previous kitchen which we renovated, we included an appliance cupboard. Loved it. Then we moved to this house which was built around the time we’d done our kitchen and NO appliance cupboard. I was cranky. I hate having appliances on my benches so I just lift it out but, yes, it is a bit of a disincentive. (So far my knees are ok!) I have a handheld mixer that I use for quick mixing, but meringues, for example (which I can eat – just eggs and sugar!) do need the Kenwood. I find that I need both the Kenwood mixer and the mini one when I’m making ice-cream. I need the big mixer to mix the egg yolks, and then I use the beater on the mini one to whip the egg whites. It is … and yet I find it hard to part with them because of the memories. 80% or more of my recipe books are over 30 years old. These days it’s much easier to use the internet, and there are more products around like, say, quinoa which can add variety to cooking, not to mention all the different “milks”. All my cooking is with soy-milk. The family loves my soy milk custard. I’m not coeliac so I don’t have to worry about specks of gluten in the kitchen when we go out, thank goodness. I just have to be careful about overloading the system. I’ll forward this review on to my daughter who goes to a lot of trouble to keep her kids on a natural diet. No numbers! Though the problem is if she likes it I’ll be the one who has to buy it. My bible was Let’s Eat Right by Adele Davis, probably not available now, and full of earth-mother mumbo-jumbo but the message was, use unprocessed food. Yum! I love all things almond so this is definitely for me. It sounds a fascinating read.